If I think back to when I was at school, there would have been nothing more exciting than the prospect of visiting London to make loads of new friends and be mentored by some inspirational trailblazers for the day. 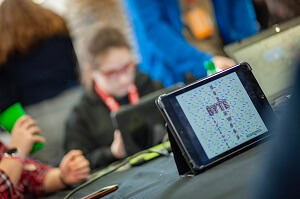 That’s why, when I saw all the Girl’s Day School Trust students coming in to Skills Matter on 15th March for the #GDSTtechathon, I felt excited for them! As they tentatively walked in and tried to figure out where they were sat, and who with, little did they know that the day would be as interesting, interactive and fun as it was. Keynote speech by Lydia Gregory, Co-founder of the AI business, FeedForward AI. All of this (plus lunch!) crammed into five hours. The organisational genius that is Amy Icke (Online Learning and Innovation Manager, GDST) truly deserves a medal for planning the day and ensuring everything ran smoothly. 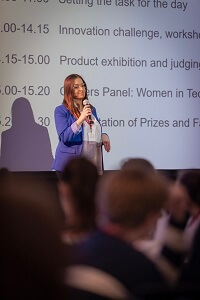 Amy kicked off the event, explaining the agenda for the day and introducing our very own Customer Engagement Manager, Dania Lyons, who explained all about Mortimer Spinks, the need for diversity, the importance of balancing the gender gap and how exciting a career in tech can be. 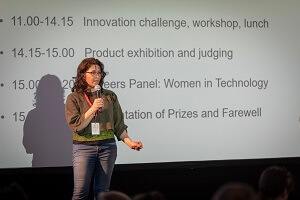 Nathalie Christmann-Cooper said a few words about the fabulous venue. It was super inspiring to have three amazing women open the event, immediately I could see the students were raring to go! We then heard from Lydia Gregory, Co-founder of FeedForward AI. What I loved about Lydia’s talk is that she did what not many AI experts do, she explained in layman’s terms what AI actually is. Type AI into Google and you’ll be presented with a lot of blue images of robots, networks, futuristic-looking things. However, AI and robotics are not the same. "AI is based on machine learning, which means it can learn things like pattern recognition, without being programmed". Whether it’s classifying the difference between cats and croissants (yes, really!) or benign and malignant cells, AI is all about “augmenting the human creative experience, rather than replacing people”. 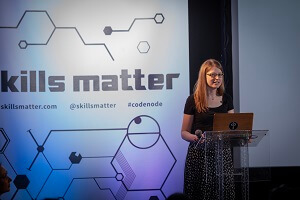 Lydia really pushed the need for diversity and collaboration in AI. The future of technology & machine learning is not going to be led by one person. The exciting thing is the collaboration. Find your own path, don’t follow others. Find people to learn from. Love the process of learning, not passing exams. If you think it looks fun and it’s important to you but you think you’re not good enough, DO IT! I overheard a few conversations from the table nearby about how the concept of AI suddenly sounded interesting...and even fun! Lydia’s talk gave everyone a lot of food for thought. AI isn’t this mysterious, sci-fi experience that only tech geniuses can grasp. It’s already here, infiltrating part of our everyday lives. It’s not scary, it’s exciting, it’s accessible and just waiting for us all to make use of it! To create a product or service that uses artificial intelligence for social good. You need to have produced a short promotional video, a model/prototype of your product and a pitch. Judging criteria: makes use of artificial intelligence, credible as a business idea, designed creatively, presentation quality. This is when the students joined forces and started bouncing ideas off each other. I was pleasantly surprised to see a lot of collaboration, as opposed to competition. 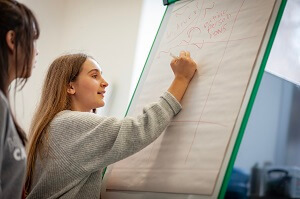 With the wonderful mentors guiding them in their discussions, the passion, determination and creativity was almost bursting out of each and every individual in the room. As I wandered round, I spied so many incredible ideas to use AI to tackle issues such as knife crime, anxiety, visual impairment, cyberbullying and more. There was brainstorming, filming, slides, rhymes, creating props and so much more! I was approached by a group of girls to share some tips on presenting, but the fact that they were extremely passionate about their product shone through and I told them that’s all they needed! They certainly wowed me with their confidence and teamwork, and I knew the judges would have a difficult task ahead of them! The judges went round and the students showcased their work. 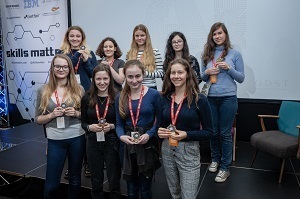 It was all very exciting, and the students were all so supportive of one another – a lot of Girl Power in the room, I felt so proud! The final part of the evening was the careers panel, hosted by Kayleigh McHale from Lovelace Digital. 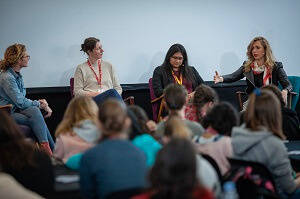 The panel consisted of Zoe Cunningham (Managing Director, Softwire), Andrea Rodrigues (Student, Ada College) and Clara Durodié (Executive Chair, Cognitive Finance Group). It was a jam-packed discussion! So many nuggets of wisdom for the students to take on board. I was in awe of Andrea, who at 17 years old, is currently working on a Character Generator (Android) App and has previously created a p5.js game to explore the creative potential of emojis! A fantastic role model for all the young females in the room. Celebrate all of your achievements. Look after your mind and body to do your best work. Some very key takeaways for people of any age, any stage in their career, any role. Then came the bit that everyone was waiting for – the judge’s results! The students were on tenterhooks waiting for Amy to announce the lucky winners. 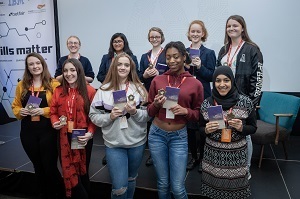 The People’s Choice award went to team Mainframe, made up of students from Blackheath and Bromley, who created an app to help those with autism overcome social anxiety. The Gold prize went to team Algorithm, made up of students from Belvedere and Norwich for their ‘Tail Won’t Fail’ idea, designed to help livestock farmers in developing countries. 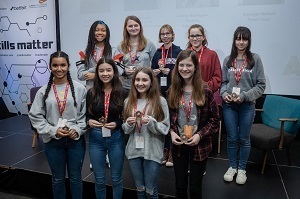 The Silver prize went to team Hardware, with girls from Northampton and Sutton making up the team, for their ‘See Through Your Ears’ product designed to help blind people by using computer vision software. What a day?! 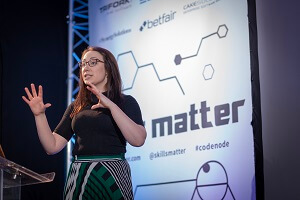 The mentors, teachers, students, organisers I spoke to at the end all left Skills Matter feeling the same as me – BUZZING! The event may have been for the students but we all learnt something new. I, for one, learned that AI is something we should all embrace and welcome into our lives. 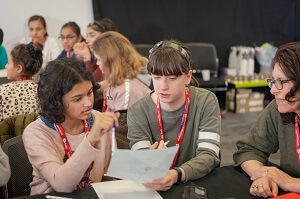 I was stunned by the amount of talent I saw at the #GDSTtechathon and if I ever was in any doubt about AI and new technology that may be thrust upon us over time, I’m now reassured that the future is in good hands. Diverse hands. Collaborative hands. Safe hands. As a crazy cat lady/foodie, it would be rude of me not to leave you with this conundrum. 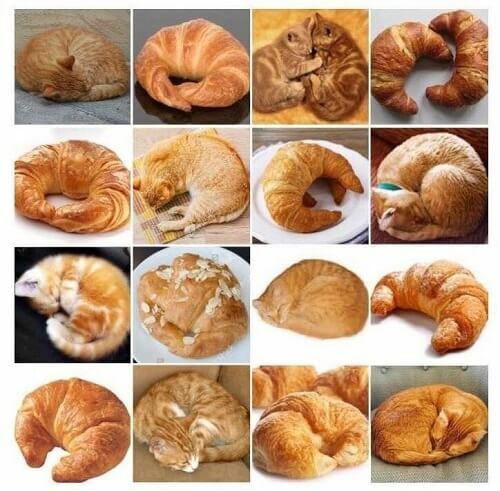 Can you figure out which is a cat and which is a croissant?